Here's the trick. Use two mirrors (taped on one edge), holding them open over photos at different angles to discover the best photo to use for the project. Copy/print reversed images - 4-6 of each orientation, depending on the angle that is used. 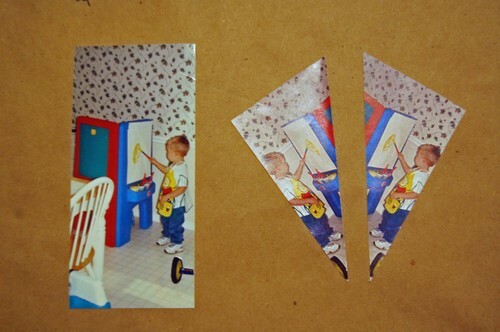 Then carefully slice the pictures to the chosen angle and assemble them using scrapbooking tape. Easy, huh? Hey, come visit me in Waco and I'll teach you how to make one...or buy this book - "Memory Makers Photo Kaleidoscopes". But it would be more fun if we get together to make one!! !